Congratulations to Ryley Batt OAM for his Medal of the Order of Australia for service to sport as a gold medallist at the London 2012 Paralympic Games. At just 15 years old Ryley debuted in the 2008 Athens Paralympic Games in Wheelchair Rugby. He went on to collect a silver medal in Beijing then lead the Australian team to gold in London in 2012. With his eyes on the Rio Paralympic Games in 2016, Ryley continues to compete in the GIO Gladiators NSW Wheelchair Rugby team. 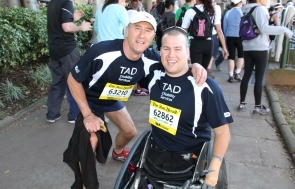 As part of his community work, Ryley lead the GIO for TAD Team in the 2013 City2Surf to raise money for Freedom Wheels bikes for children with disabilities. The Board and staff at TAD congratulate Ryley for the well deserved Medal of the Order of Australia it is wonderful to see his achievements and efforts being recognised in this way. Congratulations Ryley from everyone here at TAD Disability Services.